For the first two months after graduation, I tried to make an income through music and writing. Sadly, that did not happen. It takes time to start a career in a creative field, like music. I got a part time job and then left that for a full time job. This year in review will cover what I learned from a year out of school as well as my plans for this next year. Until this year, school was all I knew. I was in school from the age of three (preschool) until age 21. A year out of school has taught me that there is much more to life than school. I have also learned that I really do want to earn a masters degree in music. When I was still in school, I thought my desire for a masters was simply a desire to stay a student. That is not the case. I have learned how to function as an adult outside of the school/college system. I now know that my life does not need to revolve around grades or juries. School may not be the center of my life anymore, but it is still important. I had an informative phone call with a flute professor at a local college. She told me that a masters degree would give me more credentials and would show more legitimacy than just a bachelors degree. Since a music career is something I really want, I can be confident that going back to school next fall (2019) is a good decision. 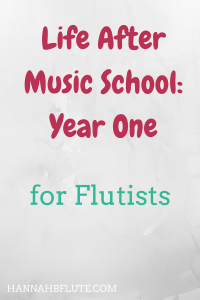 A masters degree will give me the chance to study flute at an even higher level than before. I can also choose an area within flute to focus on. Some people choose new music, others choose early music. Other flutists even choose to specialize in piccolo or low flutes. As an adult, I have had to start paying for more things myself. Living rent free at home with my parents, I need to contribute to the household in someway. I have also had to give myself music to practice. While my parents do still pay for a lot of my expenses, I am slowly starting to take on my own bills. That means I can’t just go out a blow all of my paycheck on clothes, shoes, or partying. Since I don’t pay rent, I have to do my part in other ways. I will help shop for food, set the dinner table, do the dishes, and clean around the house. If I don’t help out, my parents could charge me rent or even make my move out. When it comes to practicing, I have to find things for me to play. I am no longer in weekly lessons. It’s up to me to find repertoire that will challenge me. Yes, I do play in groups that have music chosen, but solos are my own choice. If I don’t have anything to do, I won’t do anything. I think a lot of you will agree. Living at home has allowed me to live very frugally. When my paycheck comes in, I leave some of it in my checking account, but most goes straight into savings. Saving money is important, because you never know what will happen. You could lose your job, get into a bad car wreck, or get really sick. Having an emergency fund is key. Also, since I have decided to go to graduate school, I have had to save money for that. Applications, transcript requests, and travel to auditions all cost money. That doesn’t even begin to cover tuition and fees. While I do intent to apply for scholarships and assistantships, I still need to have enough money in my accounts. There is a chance I might not get any financial aid, apart from loans, and so the more money I have saved, the easier it will be to pay for a masters. What if I auditioned for grad school? What if I applied for that cool job? Complacency has become my biggest fear since graduating. That is why I have become much more active with this blog and on social media. My online presence is my ticket to the future that I want. …in the form of a day job. I am still in the beginning stages of my career as a musician and writer. While I am serious about this career path, I do like having a job for financial support. Maybe music will only ever be a side hustle, but maybe not. In either case, having experience in a full time job will help me. With previous teller experience, I can apply for other bank jobs in the future, should the need arise. A lot can change in a year. I moved back home, got two different jobs, joined local music groups, and decided to apply for a masters. This next year will also bring a lot of change and growth. From visiting my first NFA convention to applying and auditioning for a masters of music, I can’t wait to see what this next year holds! What did you learn after finishing school? Let me know in the comments!